People working with computers need to be fast in typing. To help you, Felipe Castro released Klavaro Touch Typing Tutor, intended to teach you basics of typing and giving you occasions to practice so as to improve in speed and accuracy. Klavaro Touch Typing Tutor supports differenc keyboard layouts, namely QWERTY, Dvorak, Qwertz, Azerty, jtsuken, Colemak and Alphagrip5. You can also have this in several languages such as English, Arabic, Basque, Chinese, Danish, French, Galician, Hungarian, Polish, Russian, Ukrainian, Portuguese, Urdu and many more. 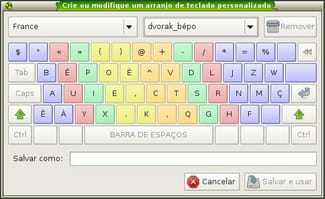 Courses are based on tips to let you memorize keys position on the keyboard. Klavaro Touch Typing Tutor offers different types of exercises aiming at improving your keyboard typing's adaptability, velocity and fluidness. After each exercises, you can check some characteristics of your performance that will be shown graphically. You will easily find where you are lacking and where you need further efforts. Klavaro Touch Typing Tutor can run as an online game. It has a clean graphical user interface. There are different levels of exercises and course. Latest update on November 21, 2016 at 05:24 PM.